Many visitors to this site may have noticed there have not been any new posts recently. Apologies to our readers but this was due to a large commitment of time that was devoted to a propane survey of Serene Lakes done over the last 4-5 months. This project came about as a result of the many propane leaks and one cabin explosion last winter due to the very large snowfall we had on the summit last winter. We ourselves reported six leaks to the fire department and we observed the responses to many more leaks by emergency responders. It was clear that one of the main problems with many of the leaks was that because of the 20-30 feet of snow, first responders were unable to find buried tanks and secondary regulators at leaking cabins. This meant that tanks went on leaking for days until the responders could find the tanks and shut them off. This led to the potentially dangerous contamination of neighborhoods with propane and eventually the voluntary evacuation edict from Placer County. It was clear that responders needed a reference resource that would allow them to quickly locate tanks and regulators and so the Serene Lakes Propane Directory project was started. The goal of the project is to produce a directory by physically mapping the location of tanks and regulators for every propane installation in Serene Lakes. This has been in progress for the last 5 months and just recently completed. The process of preparing the directory and also serving on the SLPOA Propane Taskforce has made me very familiar with many of the issues concerning propane use on the summit. In the next few posts I will be discussing what I have learned. In this post I will lay out the problems as I see them. In Part II I will share information from the survey and preparation of the directory. Finally in Part III I will discuss the outstanding issues and possible solutions as I see them. .4 psi (the working pressure for most appliances). The gas is fed to appliances such as stoves and furnaces via the internal plumbing of the house. 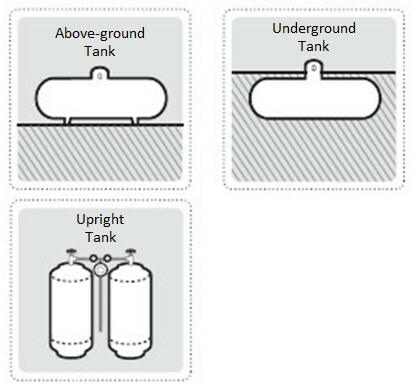 Shutoff valves are located at the tank, the input to the secondary regulator and at each appliance within the home. There is a gauge on the tank that that reads the percentage of fuel left in the tank. There is also a pressure relief valve that will vent the gas in the event that the pressure reaches a dangerous level, preventing the tank from exploding. A metal dome cover protects the first stage regulator and shutoff valve from the elements. There are millions of home propane systems installed in the United States and around the world with a very good safety record. In fact it is the safety of these systems that has made propane use so popular. That is not to say that there are not safety concerns. As with any system that deals with a volatile gas, there are safety features that must be implemented. The mature systems used today have been developed to avoid the safety problems that have been encountered in most systems in the past. Poor placement of the components of the system that subject it to possible damage. Tank and secondary regulator placement should be made to minimize the effects of weather and environmental exposure and allow accessibility to all components of the system. A leak anywhere in the exposed plumbing due to improper installation and/or breakage from external forces such as ice and snow. Improperly installed systems including the use of materials of insufficient strength can cause failure of a system. Poorly maintained plumbing can corrode leading to breakage. 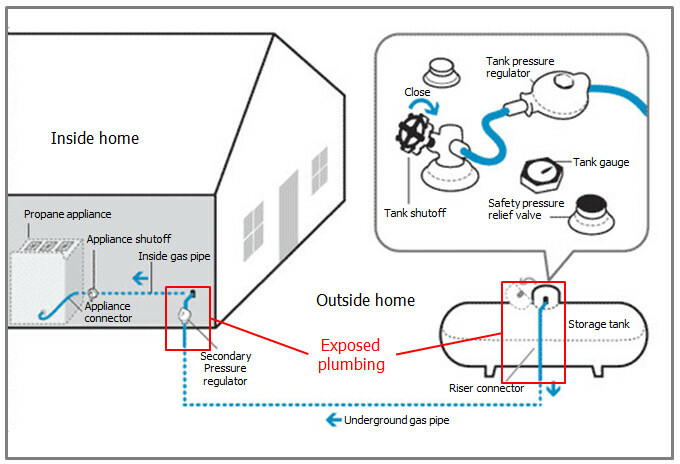 A failure of first and/or secondary regulator can result in over pressurized gas feeding into an internal gas appliance and overcoming its seals resulting in the very dangerous leakage of gas within the home. Water and ice can damage the internal mechanisms of a regulator if it is not properly protected from the elements. The problem for propane use on the summit is that it must not only be safe under the normal conditions of summer use, but also under the extreme conditions of a sierra winter with its massive snowfall. It is the exposed plumbing, shown in red in Figure 1, that is vulnerable to the massive weight and glacial motion of the snow. It must be of sufficient strength and adequately protected to withstand the power of the snow. Anyone living on the summit who has seen a deck railing damaged on a cabin during winter knows the power of 10-20 feet of snow. In March and April of 2011 there was up to 25 feet of snow on many cabins and propane installations, and the number of propane system failures attested to the destructive power of that snow. It became clear that many of the systems on the summit were not safe under these extreme conditions. The question left for residents and safety officials was how to make the systems safe even under these conditions. Current safety guidelines for the installation of propane systems are published by the National Fire Protection Association in the NFPA 58 – Liquified Petroleum Gas Code, and on the summit propane installations are regulated by Placer County or Nevada County building codes and the Truckee Fire Department. It is the fire department that performs the physical inspection of placement and plumbing when a system is installed. There are currently 6 propane vendors supplying propane for the majority of systems. It is the vendor that installs the system under the supervision of the Truckee Fire department. Unfortunately, the installation process has been unevenly administered over the last 20 years and as a result the current situation on the summit is a mixed bag of many types of installations, some properly installed and many improperly installed systems. After the crisis last winter there was a mobilization of many public agencies and organizations to try to improve the propane installations. Thus far these efforts, while improving many installations, have still resulted in a mixed bag of improvements that have been unevenly implemented. What can be done to improve their safety. These concerns are addressed in Parts II & III of this article. Thank you for the information on the propane tanks. My family and I purchased a cabin in Jan. and we need to raise our tank and are considering either burying the tank or raising the tank on concrete slabs. It would be great if you or someone could post / blog in regards to the permit process of converting electric to propane. It is very challenging to obtain a permit to install a tank. There is no process or guild lines on how to accomplish this. It is easier to go to lowes and buy a few 100 lb tanks and DIY, but this would lead to danger for all around the area. If the Nevada county had a check list or guild lines with phone numbers it would make it much easier and safer.